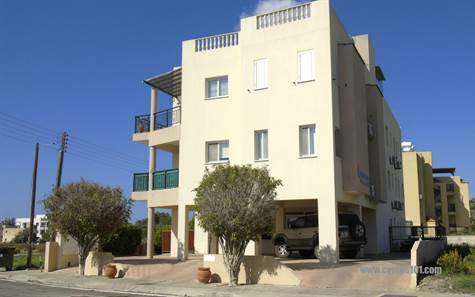 Yeroskipou, Paphos District – This well presented 2 bedroom apartment for sale in Yeroskipou is situated on a small well maintained project in the traditional village of Yeroskipou. The property is within easy walking distance to the village square and both Paphos Town and the coast are a few minute’s drive away. The accommodation features a large spacious living room with patio doors providing easy access to a covered terrace with pleasant views of the surrounding area and the swimming pool below. The separate kitchen also enjoys access to the same outdoor veranda and is well equipped with built-in oven, electric hob and extractor fan, microwave, fridge/freezer and washing machine. A hallway off the living room leads to two double bedrooms with fitted wardrobes and a modern family size bathroom. An added bonus is the wonderful roof terrace which has stunning views of the area and sea views beyond. The property is in good condition and fully furnished with title deeds. It is ideal as both a holiday home and for permanent living. An allocated covered parking space is situated near the front entrance.